When starting out on a new adventure, it helps to have a map, allowing you to determine how to best spend your time and energy at each step along the way. For chemical reactions, the same is true. Without understanding the steps involved, reactions can end up on energy-wasting backroads or creating toxic wastes. Unfortunately, few reaction maps exist because of the expertise needed to chart all the possible paths. At Pacific Northwest National Laboratory, scientists mapped the reaction that turns wind-generated electricity into fuel and the amount of energy needed for each step. It took three years and three supercomputers. "It was an outrageous amount of work," said Dr. Simone Raugei, Pacific Northwest National Laboratory, who led the research. The editors at ACS Catalysis selected it for the distinction of American Chemical Society Editors' Choice, making the article widely available. Why It Matters: Energy from wind and solar stations is typically a use-or-lose proposition. Although some storage options exist, what if the energy could be turned into hydrogen or another fuel and used when it was needed? The challenges are the same as with most journeys: speed and efficiency. By mapping all the possible steps from electrons and protons to hydrogen fuel, scientists can fine-tune the catalyst and conditions to force the reaction through the best route. This work is a vital step for wind and solar energy to play a larger role in the energy landscape. Methods: The team targeted the reaction that turns two protons and two electrons into a molecule of hydrogen with the help of the catalysts developed at PNNL in the Center for Molecular Electrocatalysis. The scientists avoided simple, perfect reaction systems and went for realistic environments. They considered -- at an atomistic level -- the catalyst, solvent, and all of the intermediates in the process. Intermediates are chemicals formed during the reaction that are then transformed again, leading to the final product. Intermediates are the way-stations on the map. 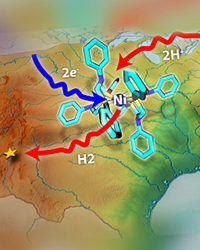 The complexity of the reactions involved an intense series of calculations that soaked up millions of hours on supercomputers at Oak Ridge National Laboratory, EMSL, and National Energy Research Scientific Computing Center. "The work was only possible through access to supercomputers, which was made possible by DOE," said Dr. Roger Rousseau, who conducts extensive modeling work at PNNL. The result was a thermodynamic and kinetic map that showed all of the possible routes, intermediates, and energy necessary to complete each step. They then confirmed the mathematical results by conducting a host of detailed experiments, looking at the energy involved in the different steps. Now, scientists are using the map to determine if they can modify the availability of protons, heat, solvent, or other conditions to speed the reaction along the fastest, most efficient route. Using the map, they've already found one path to avoid. Under certain circumstances, the reaction follows a series of turns, forming one intermediate and then the next, until it lands on a highly stable intermediate that requires an immense amount of energy to move on to the next step. This step is like being trapped in a little valley with the only way out being up a steep hill, an escape route the reaction rarely takes. This work was done at the Center for Molecular Electrocatalysis, an Energy Frontier Research Center, or EFRC, funded by the DOE Office of Science's Basic Energy Sciences Office. "It was made possible through dedicated efforts from the computational scientists who worked closely with experimental chemists in our Center," said Dr. Morris Bullock, who worked on the study and directs the center. Simulation of the electrocatalytic production of molecular hydrogen from an acetonitrile solution of protonated dimethylformamide (DMFH+) by [Ni(PPhs2NPh2)2]2+. The movie shows the current consumed at the surface of the electrode (top right) along with the chemical flux for each of the main catalytic reactions and the concentration of catalytic species at the electrode surface as a function of the applied potential as the potential is swept at rate of 50 mV/s. The contribution to the total current from individual electron transfer steps is also shown. This QuickTime movie requires a plugin. What's Next? The team is using the map to determine the speed limit for hydrogen creation. Just how fast can hydrogen be produced? And how much energy would it cost? They also outlined a possible procedure to extend the approach used to map other catalyzed reactions, such as those involved in fuel cells, which break apart hydrogen to release the electrons to do work. Sponsor: This research was supported as part of the Center for Molecular Electrocatalysis, an Energy Frontier Research Center funded by the U.S. Department of Energy, Office of Science, Office of Basic Energy Sciences. 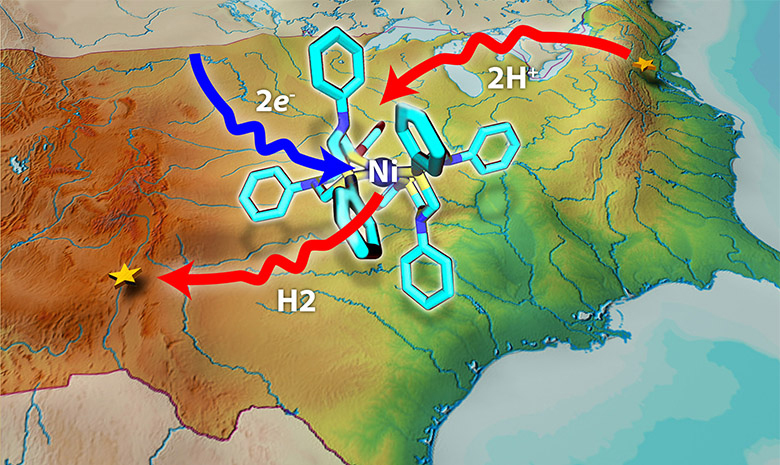 In one sentence: Scientists at Pacific Northwest National Laboratory modeled every elementary step in the complicated mechanism of producing hydrogen, providing a detailed map of the amount of energy used in the different possible routes the reaction could take.